LONDON -- The Islamic State of Iraq and Syria (ISIS) seems to have established a foothold within easy reach of Italy, and there is mounting cause for concern that the group could soon try to use Libya's coastline as a departure point for Europe-bound operatives. The militant group born out of the chaos of Syria's civil war and the ongoing security chasm in neighboring Iraq, has proved its presence in North Africa on more than one occasion, but it became the focus of real concern when a video purported to show Egyptian Coptic Christians being beheaded on a Libyan beach. In that video, a knife-wielding, masked ISIS militant points his blade to the north and proclaims that the group "will conquer Rome, by Allah's permission." Defiant Italians have mocked the threat on social media, using it as an opportunity to lampoon their own nation's transport and financial woes, but the threat could become very real. On Thursday, ISIS posted a series of propaganda photos online showing a "military parade for the soldiers of the Caliphate in Sirte." 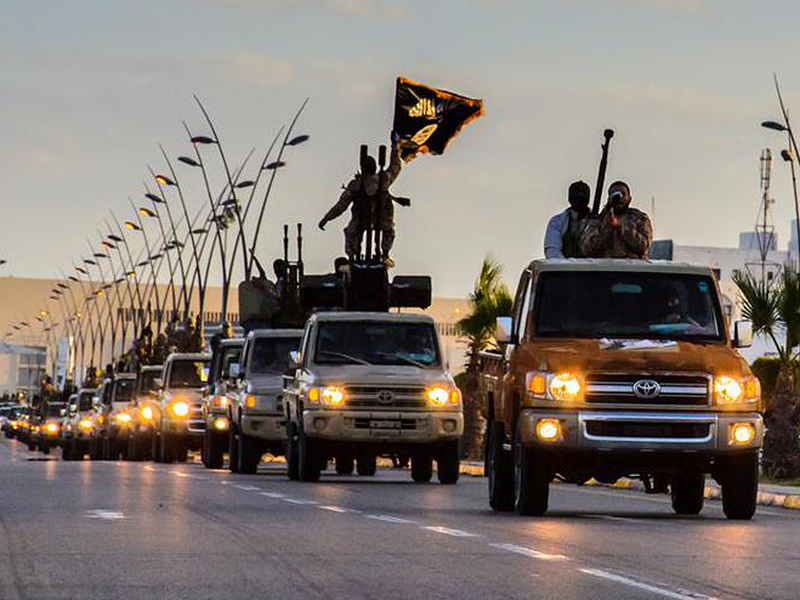 About 20 pickup trucks, carrying masked fighters, anti-aircraft guns and rocket launchers, can be seen rolling through the streets of the northern Libyan coastal city. The images cannot be independently verified, but there's little reason to doubt what they depict; a significant ISIS cell or branch just 400 miles from the coast of Sicily. On Friday, a series of car bombings had killed dozens of people in the city of al-Qubbah, east of Sirte along the Libyan coast. ISIS claimed responsibility. Libya has lacked real security of any kind since the fall of long-time dictator Muammar Qaddafi in 2011, becoming a network of allied and feuding militias vying for control of territory. In recent months, a number of these militias have pledged allegiance to ISIS. The official, Western-backed government was uprooted in the capital of Tripoli and has since tried to consolidate power in the country's east. Tripoli, meanwhile, is now held by a rival government known as Libya Dawn, which has rumored links to some of the Islamic extremist groups in the country. The dangers of leaving Libya to fester in tumult first came home to roost for Americans when Islamic extremists attacked U.S. diplomatic posts in Benghazi in 2012. Those attacks left U.S. Ambassador Chris Stevens and three other Americans dead. At the time, there was little mention of the security situation inside Libya posing any threat to the West on its own territory. But the war in Syria was still relatively young and the remarkable exodus of displaced people it has now prompted is still just beginning to hit European shores. Now, at least one loud pro-ISIS voice on the jihadist web channels has seen the opportunity presented by the combination of a near-lawless 1,000-mile coastline near Europe and a burgeoning human trafficking trade. Italy, pro-ISIS blogger Abu Irhim al-Libi pointed out on Jan. 26, "has a long coast overlooking the southern Crusader countries which could be reached using small boats." Desperate Syrians embark on "ghost ships"
He goes on to cite the "huge" number of migrant boats (he claims "at least 500 individuals on a daily basis") which leave the Libyan coast bound for Europe, packed with undocumented refugees from Syria and elsewhere looking for saner lives. "If this is exploited and developed strategically as it should be, this could turn life in southern European states into hell," suggests al-Libi. "If the right resources are available, it could also lead to the closure of shipping lines and the targeting of Crusader ships and tankers." The article he posted, entitled "Libya: The Strategic Gateway for the Islamic State," is more broadly a clear message to the group's fighters and would-be fighters far and wide that Libya holds vast potential as a potential strategic base for ISIS, as the group faces increasing military pressure in Iraq and to some degree, northern Syria. In addition to the images of the "military parade" in Sirte, Morocco's Interior Ministry said in a statement Thursday that Libya had become a "magnet" for jihadists in the region. The statement announced the arrest of three men accused of seeking to travel to Libya to join ISIS. But for Europeans already on high-alert after the terror attacks in Paris -- carried out by one gunman claiming allegiance to ISIS and two with links to al Qaeda's franchise in Yemen -- the biggest concern must be the potential for the militants to not only establish a base in Libya, but to export its fighters from that base. As CBS Radio News correspondent Anna Matranga reported, more than 3,500 migrants are believed to have crossed the Mediterranean on boats from Africa and the Middle East to Europe during January alone. That was the first month of the new European Union operation to patrol the sea for such boats, known as Triton. Prior to Triton, Italy was in charge of the patrol and rescue mission in the Mediterranean, and there have been many concerns voiced that the EU replacement is inadequate in scope and size. On Thursday, the EU's top migration official said the union was ready to "respond constructively if Italy identifies the need to step up Operation Triton." Triton, like the Italian operation before it, was principally laid out as a mission to save the lives of innocent refugees. Thousands have been rescued after being crammed onto old ships by smugglers, who then often leave the vessels on a collision course with Italian shores and abandon ship. It is not, however designed as a law enforcement mission. The overwhelming influx of refugees from the Syria war shows no signs of easing any time soon. An estimated 170,000 migrants made it to Italy's shores by boat during 2014, and it's unclear whether European authorities can even hope to keep tabs on who enters this way, and where they go once they do. According to an article published earlier this week in The Telegraph of Britain, Egypt's ambassador to London warned officials in the U.K. that "boats full of terrorists" could soon head for European shores if something is not done to address the chaos in Libya. Asked whether Britain's Home Office, the government department in charge of law enforcement and border agencies, was worried about militants crossing into European territory on migrant boats, press officer Ben Stack would only say "we do not comment on matters of national security." But the Foreign Office in London did acknowledge the rising threat in Libya, calling for the global community to "come together and work for a Libya that has a national unity government, obviously excluding terrorists, and that can start to build the institutions of a state." A Foreign Office spokesperson told CBS News that ISIS represents "a clear national threat to the U.K., as it is a global threat to our international partners and the region." Do Americans want to send ground troops to fight ISIS? There has been little consensus, however, from the global community on how ISIS can be tackled in its new stomping grounds in North Africa, or how Libya can overcome its deep divisions and forge a unified national government. Egypt's leader, President Abdel Fattah el-Sissi, has called for a United Nations-backed military coalition. His country pushed for a UN Security Council resolution last week which would begin to pave the way for such a military coalition and ease arms embargoes on Libya's Western-backed government to enable it to more easily procure weapons. But the U.S. and Britain rejected the call for a resolution, pushing instead for a political resolution to the crisis of leadership in Libya as a seeming prerequisite for tackling the militant groups operating inside the country. Speaking to reporters last week after the emergency UN Security Council meeting on Libya, U.S. State Department spokesperson Jen Psaki said "we continue to believe that in Libya a political solution, one that is non-intervention, is the right path forward."